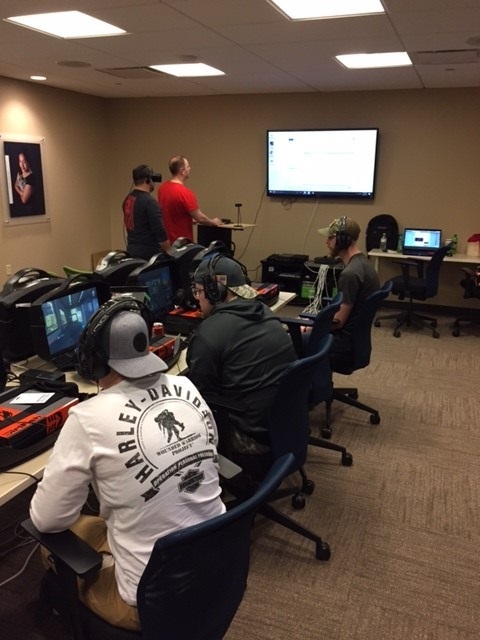 PITTSBURGH (Feb. 22, 2016) – Video game night made a triumphant return to the Pittsburgh Wounded Warrior Project® (WWP) office, providing injured veterans with a night of friendly competition, food, and fellowship. Stack-Up, a charity organization that brings veterans and civilian supporters together through a shared love of video gaming, co-hosted the event with WWP. While video gaming often carries the stereotype of being an anti-social activity, it’s the opposite for one Marine Corps veteran. For George, gaming not only offers a chance to connect with warriors at WWP’s office but also outside of it – online, whenever he wants to. In a WWP survey of the injured warriors it serves, more than half of survey respondents (51.7 percent) talked with fellow veterans to address their mental health issues, including post-traumatic stress disorder (PTSD). For many veterans, the experiences they had in the military were some of the best of their lives, filled with camaraderie, meaning, and direction. But upon return to civilian life, the isolation they face can be one of the most significant struggles wounded warriors deal with. It can be difficult knowing how to overcome that challenge. WWP and Stack-Up have hosted several game nights at WWP offices to provide bonding opportunities that extend beyond a single gathering. WWP programs assist injured veterans with mental health, physical health and wellness, career and benefits counseling, and connecting with other warriors and their communities. All programs and services are offered to warriors free of charge thanks to generous donors.